You know the morning routine: Grind the coffee beans, fire up the coffee pot and drink copious cups of hot java. The thing about routines is that they get old. Mix yours up by purchasing your very own Grow Your Own Coffee Kit. 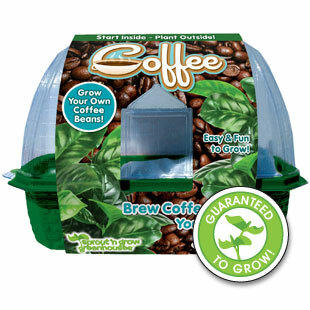 The kit includes coffee bean seeds, a windowsill greenhouse pot, planting mixture and detailed instructions. This Coffee Greenhouse works in any climate, and you don't have to be a gardener to drink the fruits of your labor. This plant is easy to maintain and is sure to excite coffee lovers. Everything you need to grow your own coffee plants. Guaranteed to sprout in 3 to 4 weeks. Coffee plants exhibit showy leaves and white flowers. Easy and Fun - plus makes a great gift!